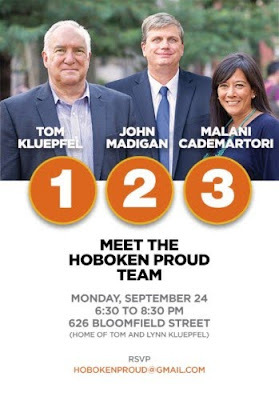 MSV: Introducing Hoboken Proud 1-2-3 for School Board! Introducing Hoboken Proud 1-2-3 for School Board! Incumbents Tom Kluepfel and John Madigan have joined with district parent Malani Cademartori to form a three-member slate seeking election to the Hoboken Board of Education in November. "This team will raise some eyebrows," says Tom. Tom and John ran on opposing slates in 2015, but they’ve found common cause in strong support of the superintendent and forged a solid working relationship on behalf of the district. Malani, an active advocate for the children of the district, will continue to protect and support the district and its recent achievements and is familiar with the issues facing the board. John hopes this apolitical alliance will help unite the Hoboken community. They believe this is an opportunity for all of Hoboken to come together and focus on what's best for all district kids. Tom was elected to the Hoboken Board of Education in 2012 and reelected in 2015. In that time, he has served as chair of the Finance Committee and as president of the board for the past two-and-a-half years. Tom is a retired creative director. His wife is a special education teacher; they have two grown children. John has served on the HBOE since 2015. He is a clerk in the William J. Brennan Courthouse in Jersey City. John's wife is an ICU nurse at Hoboken University Medical Center; they have two grown sons. Malani is an active district parent, serves as the Calabro school’s PTO president for a second term, and was a main organizer of last year’s first ever district-wide PTO Harlem Wizards fundraising event. She is an attorney and partner with a N.Y.C. law firm where she focuses on corporate reorganization and restructuring. She and her husband have two young daughters in the district. Please join Hoboken Proud for their official Kick-Off event Monday, September 24. Grab a friend and come meet the team!